Reflecting back on the 2018 LGCT and GCL season, what were the highlights for you and which moments make you smile the most? Obviously [LGCT] Miami Beach was a great start of the season for me and without this I wouldn’t have had the opportunity to compete in Prague for the [Longines Global Champions Tour] Super Grand Prix. Then going on to win the LGCT Super GP was incredible and a moment in my career I’ll never forget. Not only was it about winning, but the class itself was full of surprises and when I was standing on the podium my parents were opposite me - cheering and very happy - which gives me a very special memory. In Berlin we won the GCL team competition which was also very exciting for me as it was my first team win for the St Tropez Pirates. You beat 15 other world class riders in the Longines Global Champions Tour Super Grand Prix last December in an incredible new competition for the sport. Just rewind back to that moment and tell us what it meant to lift that trophy? Well firstly being the only women I guess made it a bit more interesting for the competition but I think I would have to say that it felt like my work had paid off. Sometimes we all work very hard and don’t succeed but it’s always very important to just keep thinking positive and keep striving for success. I really know this happened to me especially for this particular competition as I had really planned my whole year around trying to win this unique Grand Prix - and as it turned out, there I was holding the trophy. It’s with thanks to all my team around me - I couldn’t have this success without them - and of course my amazing horse California! 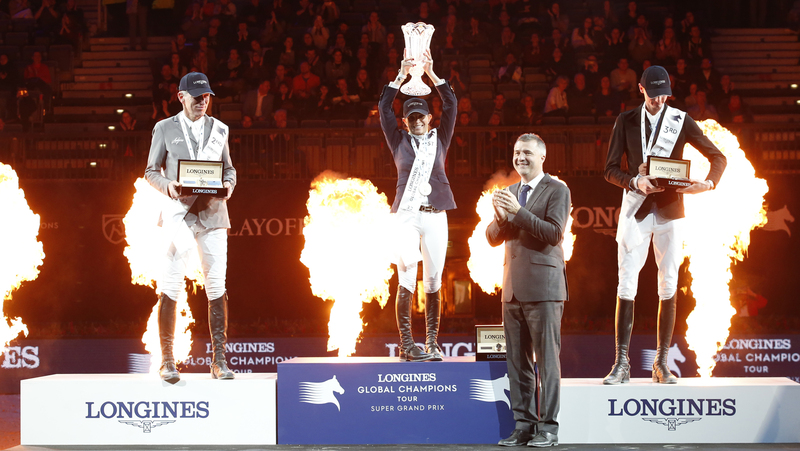 The inaugural GC Playoffs in Prague were a spectacular innovation, with Ludger Beerbaum declaring it 'a milestone in the history of show jumping'. What was your impression of the event and why was it so special? I’ve really never experienced the sport in this way. I’ve been competing at the top for many years but this show really has something special, like no other equestrian event before. I know so many people were watching the live stream and have said they can’t wait to come and see it live this year. I think apart from all the spectacular shows and with amazing lights and displays, the riders were really competing under so much more pressure than normal. Because of this there were so many unexpected surprises that made it very exciting. The jumps were all new and the courses were very challenging. Having three in a team really made it important for every rider to be at their best. The public were so motivated and excited which also gave an incredible atmosphere. There was over 30,000 spectators. I had over 150 WhatsApp messages which was just amazing, and for a first time event it’s hard to imagine how to improve it! What is your focus for 2019 and main goal? If I have the same year or better I will be very happy! But I’d love to try to win the overall [LGCT] Championship again. Which horses can we expect to see in action this season, and who are you most looking forward to showing and why? I have three Grand Prix horses - California, Incaboy, and Vinchester who is new at this level. I can’t wait to get him outside and I’m really looking forward to starting the season again.